We hold danceshow fundraising events and obtain our toys and school supplies from community donations. We then ship these supplies from the US to Nicaragua via freight forwarders who charge us $1 per pound. We usually ship 10-12 boxes full of toys and school supplies thus it costs us over $1000 in transporation costs. Unfortunately, transportation is one of our most expensive costs and we are in need of a sponsor. 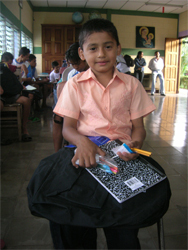 Once in Nicaragua our team sorts through the boxes and creates packages of toys and school supplies. We fill bookbags with pencils, sharpeners, crayons, paper and a toy. When we start to run out of supplies we provide the children with a toy or some school supplies (such as a pencils, or crayons). Once packages are made we make daily trips to orphanages, schools, and small poor dirt road villages. We hand deliver the supplies to children ourselves. There are no intermediaries involved. Join us in our yearly humanitarian mission.